The Russian Navy expects to receive two advanced frigates by 2020. The Russian Navy is expected to commission two Admiral Gorshkov-class (Project 22350) guided missile frigates equipped with advanced weapons systems by the end of 2020, Russia’s Defense Minister Sergei Shoigu told Russian media on March 7. The announcement is yet another confirmation that Russia’s shipbuilding industry is incapable of sticking to the timeline of Russian President Vladimir Putin’s ambitious naval rearmament program. “By late 2020, the Navy will receive two most advanced Project 22350 frigates armed with the Kalibr and Oniks modern strike complexes,” he told reporters in a conference call on March 7. The Kalibr is a supersonic cruise missile available in land-attack, anti-ship, and anti-submarine variants. This missile is nuclear-capable. The P-800 Oniks is over-the-horizon supersonic anti-ship missile with an approximate maximum range of 600 kilometers. Russia no longer has access to Ukraine-made gas turbine engines and is in the process of trying to indigenously produce a propulsion system for its large surface warships. Russia may still have enough engines in stock for the first two Admiral Gorshkov-class and three Grigorovich-class vessels. However, it is unclear how quickly Russia’s shipbuilding industry can design a gas turbine of its own. Another factor to consider is Russia’s depleted finances. If the defense budgets declines in the coming years, it is likely that funds will be relocated from the surface fleet to the submarine force. 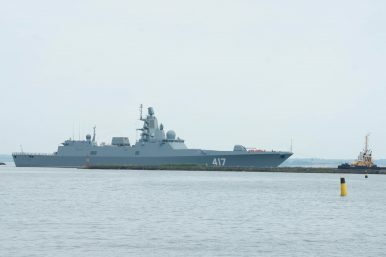 Given all current limitations, it remains to be seen whether Russia can fulfill its pledge to introduce 16 Admiral Gorshkov-class guided-missile frigates into the Russian Navy in the near-term future. The two new warships were officially laid down at the Sevmash shipyard in northern Russia on April 23.